Are your signs conveying the right message? The moment a new customer walks through your door, they’re looking for signs to navigate an unfamiliar space. Well-designed signage allows customers to comfortably order food and beverages, find their way around the space, learn about your brand and products, and even share their new discovery with social media followers. There are an endless number of options these days: painstakingly handcrafted signs painted by professional artists, tried-and-true chalkboard signs, high-tech LED screens that show high-res photos of products, and the trendy letter boards of 2018. 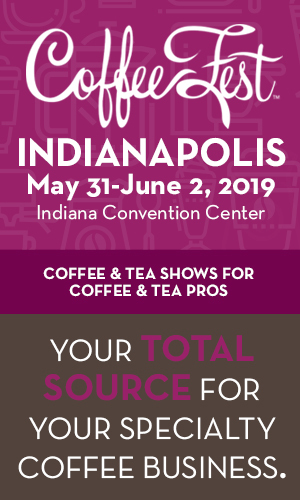 Experts in sign manufacturing, interior design, and running a café have shared their wisdom with Fresh Cup on the best way to ensure your café communicates the message that you want customers to receive. Andee Hess, the founder of Osmose Design in Portland, Oregon, has a track record of designing influential interiors for trendsetting food and drink brands including Stumptown Coffee Roasters, Salt & Straw, and Small Tea in Miami, Florida. 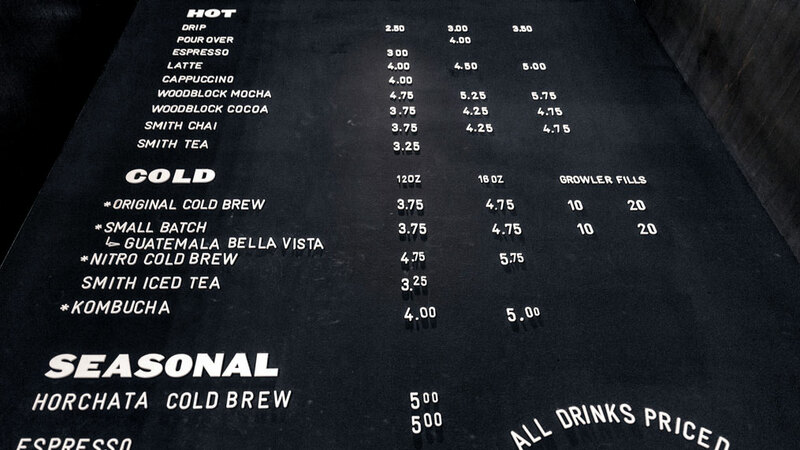 Stumptown uses a mix of chalkboard and letter board signs for its menu. Photo (above) by Nicolle Clemetson. 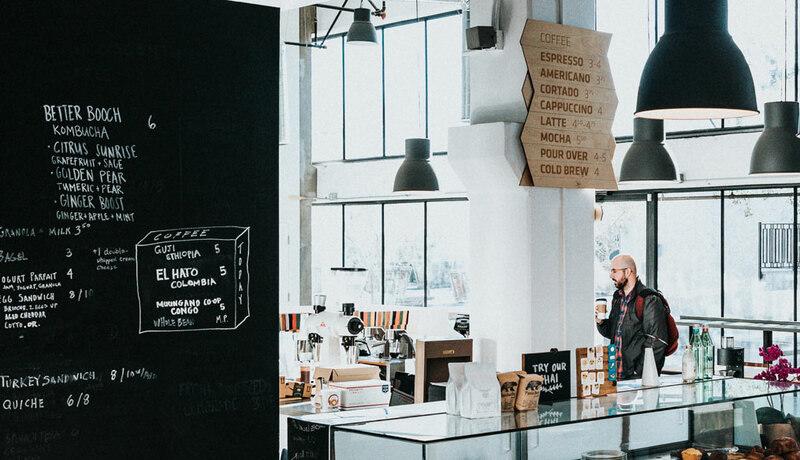 Whether you’re planning the buildout of your first café, opening a second location, or redesigning a few shop elements, it’s a good practice to take some time to define your brand and who your audience is. If you’re going to open a location in a part of town that you’re unfamiliar with, get to know the locals. Do you want to serve hurried professionals in the early morning on their way to work or the lingering parents and their pre-K toddlers in the afternoon? Both? While a rushed banker in the morning won’t care much about where your restrooms are, you can be sure that a parent with a messy eater will feel at ease knowing there’s a washroom nearby and whether or not they’ll need to ask for a key. Thinking about local demographics, who you want to attract, their unique needs, and their aesthetic preferences will be essential in selecting verbiage and materials that are welcoming and useful to customers. Once you’ve defined your target market, start gathering examples of design elements, colors, typography, and materials that your customers will respond positively to, and that you’re excited about as well. Use the examples to develop an overall mood or concept for what your space will communicate. Menu items should be determined by brand identity, customer preferences, and what the café space is capable of producing. 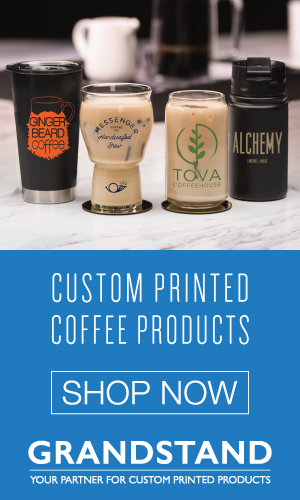 Consider whether you will include origin names next to your brewed coffee offering. 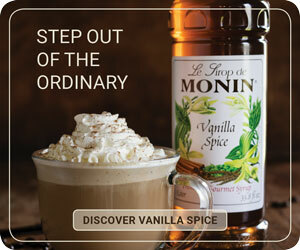 Will you promote a selection of flavored syrups to add to lattes? Will you offer food? What kind of food makes sense in your space, that your customers will like, and is on brand? Write out exactly what you want customers to see when they read your menu and group items based on categories such as coffee, tea smoothies, food, etc. Also, think about how often you plan on changing menu items, whether prices are likely to change, and where the best spot in your café is to place this information. This step will be key when determining what the menu looks like. 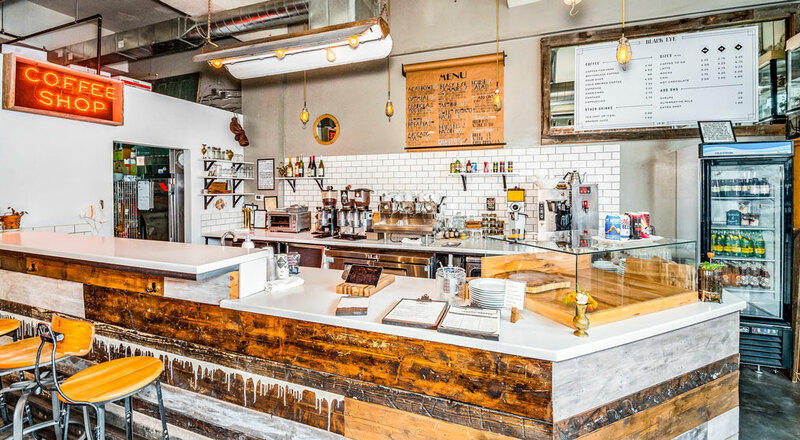 Black Eye Coffee in Denver, Colorado, features two menu boards: a vintage mirror that was salvaged from a local bar features the shop’s coffee offerings, while a roll of butcher paper displays food offerings and is rewritten twice a year for seasonality. 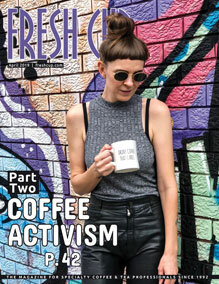 Michelle Ackerman, Black Eye’s owner, chose that format specifically because the coffee offerings remain fairly constant while the food menu is refreshed seasonally. And in the rare occasion that Black Eye has to change its coffee prices? “It’s basically a sticker that’s been made that we stick onto the glass, onto the mirror,” says Ackerman. Menus communicate your product offering, but there’s also the rest of the space to consider. There’s wayfinding, regulatory, informative, retail, and branded signage to fill your space with. Every word choice reflects your brand and can inform the customer experience, but some experts caution against over-communicating. When planning signage throughout the shop, Hess advises that owners take the information they’ve developed to describe their brand and distill it into the most concise language possible. “People are smart,” she laughs. “They will figure it out. We don’t have to dumb it down for them too much.” Having less text also saves hassle later on, as phrasing and certain language can become dated and needs refreshing. Try using icons or images where possible, as they can have a more emotional tie to your customers. Ackerman chose to use vintage postcards of Denver and famous boxers for her table numbers at Black Eye. The cards let the kitchen know where to deliver food, while customers, unprompted, often take photos of the unique and personal touch for social media. One simple and inexpensive way to test out the functionality of your signage placement is to run a prototype test using design thinking. With just some paper, a marker, tape, and a few friends, you can create a mock-up of your signage in the space and simulate a regular day of business. Invite some friends who are unfamiliar with the space and have them pretend that they are new customers coming in to order drinks and navigate the space. After 10 minutes or so, talk to your participants to find out what questions they had and if your design had the desired effect. It’s far cheaper at this stage to take feedback and alter the design, rather than later down the road after everything has been manufactured. You may need to run this exercise a few times before you find what works. Now comes the fun part: making all your concepts a reality. Choosing materials, typography, colors, size, and placement of your signs should communicate a consistent story and feeling throughout your space. If you’re building your shop from scratch, you may want to find an interior designer who can develop a complete buildout and design concept for you. If you’re designing the buildout yourself or only refreshing your signage, you can work directly with commercial companies, like Fastsigns, or local artists. Ackerman reached out to her own customer base when it came time to design new signage. Make sure that whomever you’re working with understands your brand aesthetics, customer needs, and placement by having a conversation with the designer using examples from your mood board to demonstrate what you’re looking for. Often when working with a branding firm, graphic designer, or interior designer, they’ll be able to draft a digital mock-up of the buildout so you can get a sense of where text will appear, the scale, and color choices. 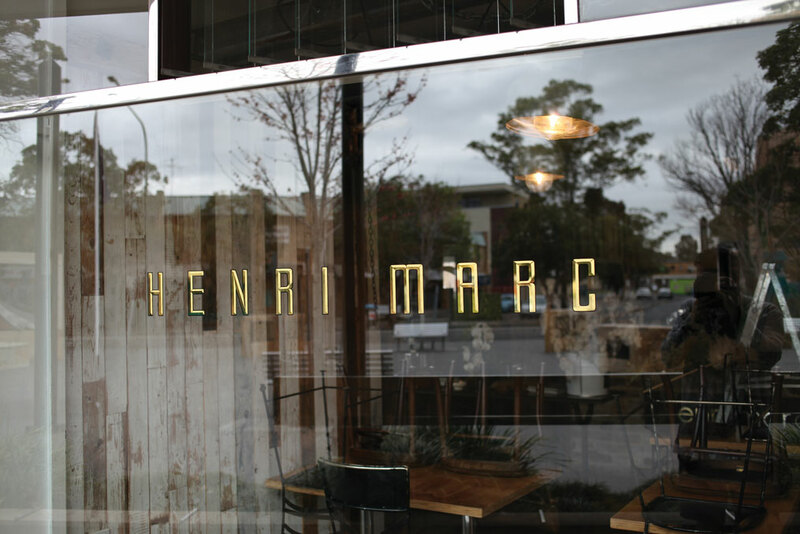 Will Lynes, a Sydney-based sign designer whose company, Lynes & Co., specializes in hand-painted signage, gilding, and decorative glass work, recommends that café owners think thoroughly about physical material and their appearance in real life before committing to a particular design. Guilded lettering by Will Lynes. “There’s a little bit of a disconnect between how [the sign] looks on screen mocked up versus how it looks in real life when you actually view it,” he says. Lynes recommends talking to more than one design professional and using their expert opinions to inform design decisions. When completed, well-functioning signage will build a base of regular customers and boost sales. Ackerman found that the scale and placement of her menu board plays a big role in managing lines. “Functionally, it’s really nice because people can make it through the line pretty quickly and they’re able to see quickly what’s offered and instantly know what they want, as opposed to wandering around trying to decide,” she says. In just the last decade, signage trends have changed drastically. 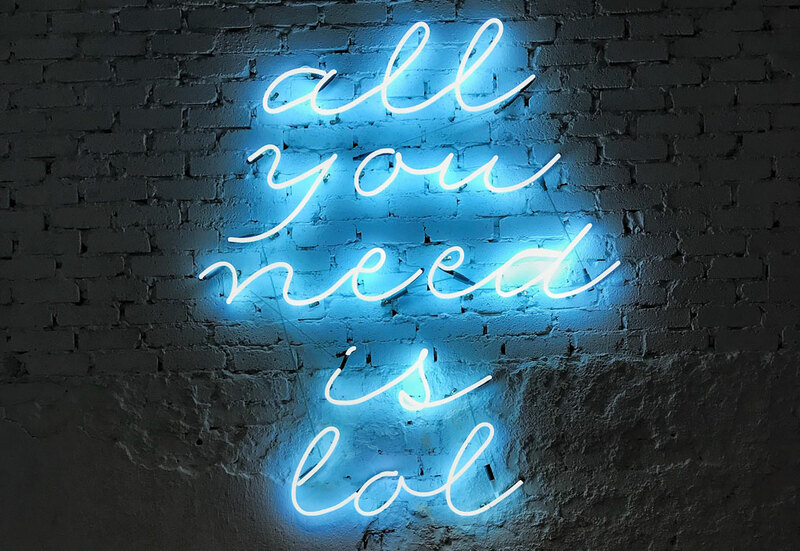 Neon, custom letter boards, and “Insta-worthy” signage have all started to become ubiquitous in café spaces around the world. Social media platforms like Instagram and Pinterest are the likely cause behind these shifts in taste. While social media can be an excellent source of inspiration and a great marketing tool, overemphasizing social media’s importance can lead to derivative design or signage choices that will quickly become dated. Hess is excited to integrate more backlit and glowing graphics into her own work. 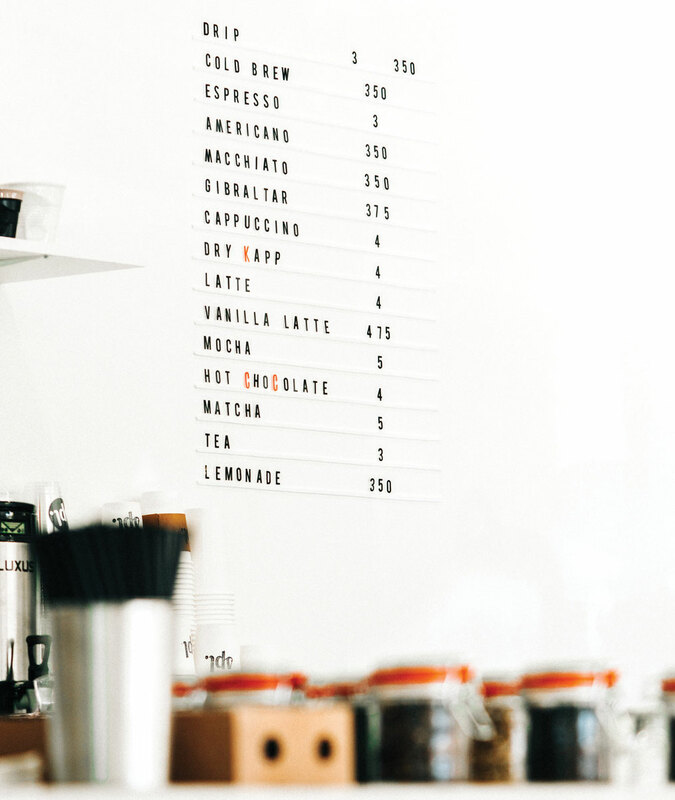 Whatever ends up as the next big thing, café owners should always make sure that their signage makes sense for their own brand, their customers, and their business.